From time to time, The Modernist Angle will share with you a few of our favorite products, materials, innovations, etc. that are tailor-made for modernist residential design. Full disclosure: We are not being paid, sponsored by, or receiving anything in exchange for sharing these products. If you’re planning to build a new modernist house or renovate and remodel an existing one, you may want to add these to your files. And we welcome you to share your favorites with us -- from tried-and-true items to brand-new discoveries -- in the Comments section below. 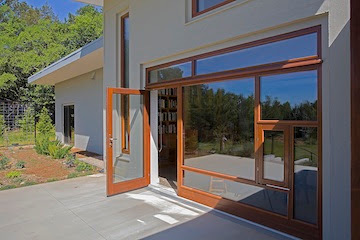 Hardwood-framed, triple-glazed, passive house-certified windows and doors by Klearwall® are as energy-efficient as it gets (with a U-value of .14) and beautiful t’boot. For this modern Net Positive house with thick concrete walls (above and below), architect Arielle Condoret Schechter, AIA, of Chapel Hill, NC, specified Klearwall® windows and doors throughout. Above, she custom-designed a wall-sized composition on the southern elevation to include a door and an operable section that supports cross ventilation. 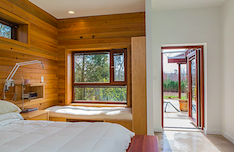 Below, a Klearwall® window and exterior door complement horizontal wood paneling in the master bedroom. All Klearwall® Passive House windows and doors are certified by the Passive House Institute in Germany. They’re also manufactured in Germany in a Net Zero facility. Another modern, Net Zero house designed by Arielle Condoret Schechter. About 100 years ago when virgin cypress forests were being harvested, some of the larger logs became submerged. If they couldn’t be recovered from the bottoms of lakes and rivers, they remained there. Over recent years, lumber companies have been retrieving those old logs and the lumber they mill out of them is called Sinker Cypress – an odd name for a gorgeous wood that reveals deep, rich colors ranging from a golden honey hue to dark olive green. 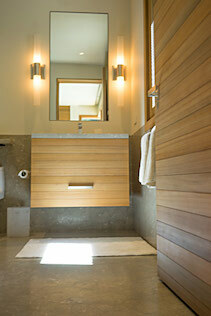 Sinker Cypress works beautifully with modern home designs, especially the clear “Select” grade. Since no trees are felled to create it, Sinker Cypress is an obvious eco-friendly choice. Extremeconcrete® is an award-winning, sustainable, high-performance concrete that recycles waste materials, such as post-consumer glass, shredded plastic, and silicon byproducts. Extremeconcrete® surfaces can be molded into any shape and finished in a variety of textures and colors, like the choices above. Extremeconcrete® tiles and surfaces are NSF Certified, LEED® contributing architectural products. Now it’s your turn. Want to share a few of your favorite things below?